My good mate Jason Holtz will be fishing Ascension Islands over the next 2 months. He’s running the “Harmatan” with his regular Kona crew Brian Toney on the deck. Jas and BT have been on a roll this year. From weighing an 1104# blue back in April to placing in the prestigious HIBT tournament, I’m sure their good run will continue in Ascension. Olaf Grimkoski will be joining BT in the cockpit. Jas sent me the first report of the season a few days ago. The boys went out for a sea trial and got climbed on by a big girl after just a few hours of trolling. BT jumped in the chair and fought the big blue for around 35 mins. The fish was a real tough one and Bt put a lot of drag on trying to lift her. They eventually pulled the hook and Jas told me it was hard to get a good look at her through all the white water but from what he could see she was well over 800#. Not bad for their first day out! 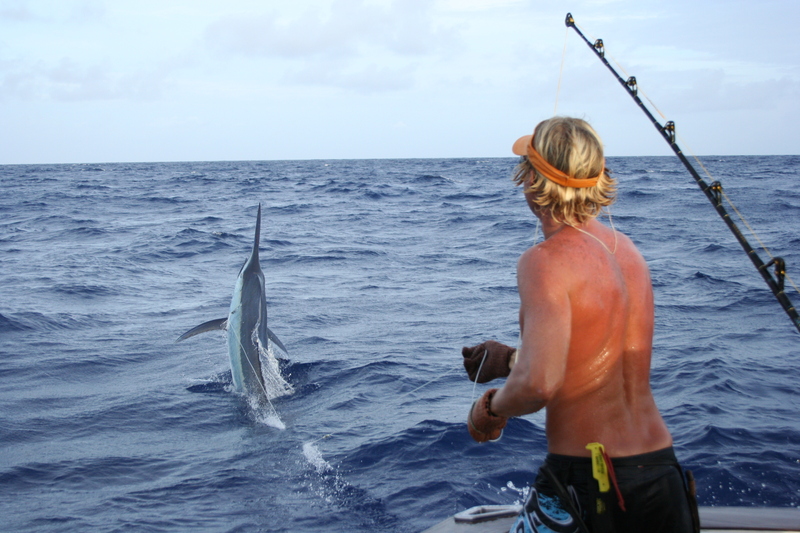 Ascension Island is still a young fishery but it has already produced a lot of big fish. The first season “Gods Favour” fished there back in 2002 they weighed a 1337# beast, the third largest blue ever weighed in the Atlantic. Since then there have been numerous grander’s weighed there. I just know the boys will get a few shots at four figure fish this season. Jas will be sending me regular reports which I will post on here so keep checking for regular updates. Just received a report from Jason. He said they are seeing fish everyday,getting enough bites but having a hard time staying connected. Today they went 1 from 3 catching a small fish around 250# from a doubleheader. He also told me the Obadu Wiring Gloves are working well for BT.